This section of help is designed for the TOTAL newbie. It starts with the very very simple basics, and ends with a brief introduction to ZZT-OOP. It doesn't tell you what not to do or give any kind of help into how to make a game good; for that, please visit Funk's Guide. So, let's assume that you just found this website because you were curious as to what ZZT is, or you had heard of it in the past and could never be bothered to really check it out untilnow. This help file is for you. We will start with the VERY basic. If you have ever run a DOS program before and know how to unzip a file, you can skip this part and go right on to the next. ZZT can be used to make games and play games made by other people. Made in 1991, it still uses ASCII (or text-mode) graphics. This is all very nice, but how do you use it? Well, first of all, ZZT is not meant to run under Windows. ZZT is a DOS program, and it was designed to run under DOS. Don't run away just yet! Even if you don't know anything about DOS, ZZT will almost certainly run fine under your Windows system. You don't need any special software to run ZZT, if a problem does arise, Chapter 6 might be able to help you. Anyway, I'm getting ahead of myself. Provided you have Windows 9x/ME/XP/2k and maybe 3.x, this should tell you EVERYTHING you need to know. I make another assumption--that you are using one of the popular web browsing clients (IE, Opera, Mozilla). If not, I strongly suggest you grab one of them, as most sites--including this one--are created with them in mind. While all modern clients are generally the same, I will talk through the downloading with IE 5+, the most popular client by far. 'Downloading', in a simple context, means transferring something from the internet onto your computer, so you can play it later. ZZT and all ZZT games must be downloaded before you can play them--Most peoplewould have done this before, but if you haven't Don't worry, the process is simple. First, open up your copy of IE and log on to Z2. Go to the 'Download ZZT' page. The version of ZZT you want is version 3.2--this is the newest version that almost everybody uses to make and play games. Move your mouse over to the link and right click. This menu should come up--click 'Save Target As...' and choose a place on your hard drive to download to. (In case that doesn't work, you can also download ZZT here) You can place this anywhere you want, but you might want to put it somewhere easy to find, like on your desktop; don't worry, you can always delete this file later! ZZT is a very small file, so it shouldn't take more than a minute or two to download, even on outdated modems. If the download hangs (stops working) for no reason, give it a few minutes, cancel it, and try again--it should work. You will have the choices of closing the box, opening the file, or opening the folder. Here is where it gets a bit complicated. Because we are required to distribute ZZT with many files, it is much easier for us to 'pack them up' so that instead of downloading 50 files, you only have to get one. This also makes the file size a lot smaller, so it's great for downloading. This whole process is called 'Compressing' or 'Zipping'. The output is .ZIP file--the only drawback to this is that you need special software to 'Decompress' or 'Unzip' the file (unless you are running Windows XP, which can open .ZIP files as folders). Luckily, there are many Windows programs that allow you to do this--for ease of use and generally great usability, we recommend WinZip. If your computer already has this, don't worry. If it doesn't, head over to the WinZip homepage and grab a copy. Open it by clicking on "Open" when the downloading is finished--make sure the 'Close this dialog box' option is unchecked--follow the install instructions and soon WinZip will be installed. Once you finally have ZZT and WinZip, load up WinZip, go to "Open" and find zzt.zip. Open it up and you should see something like this. This is all the files that we have to (legally) send with every copy of ZZT. Bear in mind that there are some games, some documents, and a lot of these files are not REQUIRED to run ZZT itself. Anyway, click on "Extract" and choose a place that you want ZZT to be 'installed' to. A sensible place would be a folder called 'ZZT', but it really doesn't matter. It will take a second to extract, then you can close WinZip--don't delete or uninstall it; you will need it if you want to download any other ZZT games. As said earlier, ZZT was not designed for Windows, so, even though it runs, it won't have the luxuries of a normal Windows program, so you won't be able to access it from the Programs menu. Instead, you will have to go to Run (alt + r) and type in the name of your ZZT folder (you can always create for own icons and shortcuts to ZZT if you know how--check a Windows tutorial page). 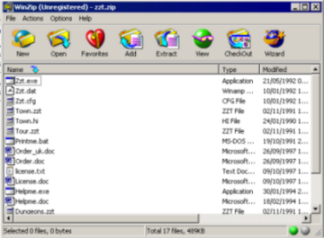 Once you are in the folder, locate the file named 'ZZT.exe' it should have a little icon that looks like a mini-window. Double click on it, and if all goes well, you should see the ZZT start-up screen. If it's in a Window, hit ALT+ENTER to place it in full screen mode--this is what almost all ZZTers use, as Windowed ZZT, while it has some advantages, will mess up the graphics and make gameplay significantly slower. Congratulations! You have just successfully downloaded ZZT and are ALMOST ready to start making games--if you had any problems with this installation, check the troubleshooting of this guide, and if you STILL experience problems, email us and we will try to fix it. If you are happy with what you've done so far, continue to next page, which will teach you the very basics of navigating around ZZT, and what 'STK' is. Good luck! Note: If you are scared of downloading because you are freaked out about 'viruses' that might harm your computer, we do make every attempt to make sure everything on the site is virus free and are almost 100% certain files are safe--however, one can never be absolutely sure--so, if you are scared, grab some anti-virus software--check out Sophos and Norton, or take a look around Google.